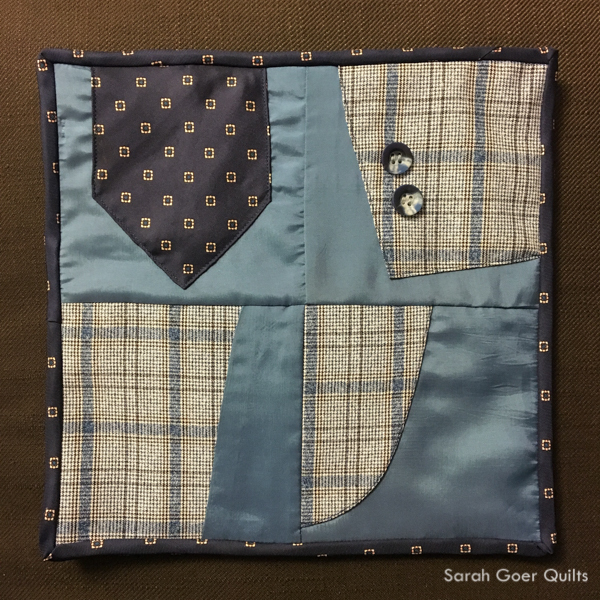 This week's challenge for Project QUILTING was "well-dressed man." On Tuesday, the kids and I made a trip to Goodwill in search for an inspiring men's jacket. I was interested in a jacket with elbow patches (which this one didn't have) and interesting buttons. I just couldn't resist this plaid jacket! And it had a great solid blue lining, too. We chose a tie to go with it. At the register the man helping us commented that "dad [was] getting a new jacket" and my kids prompted corrected him that it was for me. I laughed and said that I was going to make it into a quilt. He chuckled, then asked if I was serious. I explained the challenge and he asked if I'd bring in my finished quilt to show him. 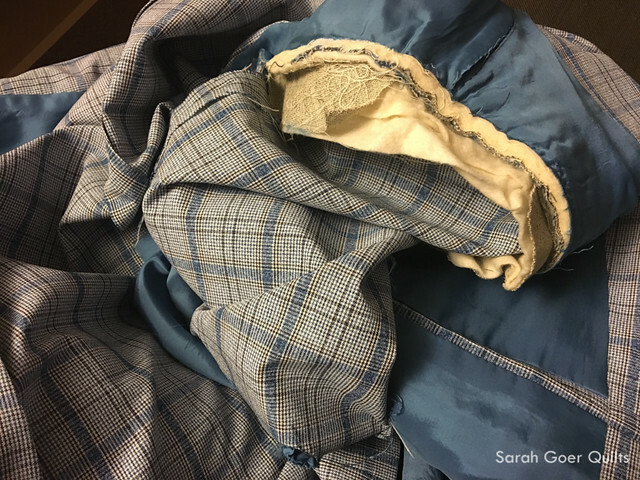 I knew that I wanted to highlight some of the features of the jacket, but I didn't really have a plan for the construction of my quilt. I finally got to work deconstructing the jacket on Friday night. I cut out some sections that I liked, but didn't get back to my sewing machine until almost 10pm on Saturday. With about 12 hours left in the challenge, I knew I had to take my friend Mel's advise and work small. I edited down my initial ideas and decided on making the blocks even smaller than I'd planned. One feature that I liked was the section from the front of the jacket that had the full pocket. When I decided to make my blocks smaller, it eliminated the possibility of using it as a block. Then I realized if I trimmed my blocks down to 4.5" finished squares I could use the pocket as my backing. 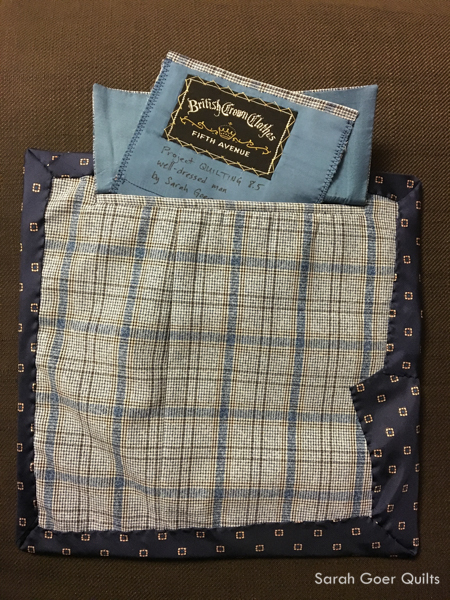 I used a remnant piece of batting and bound my quilt with the tie (deconstructed to only be the top layer of fabric). In the end my mini took me about 2 1/2 hours to sew and finish. 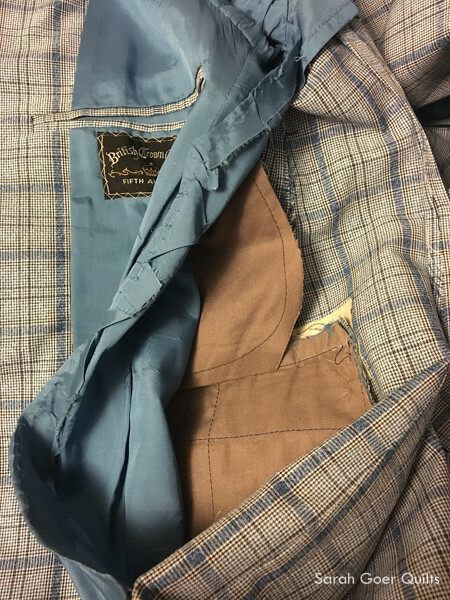 The solid blue is the jacket lining fabric. 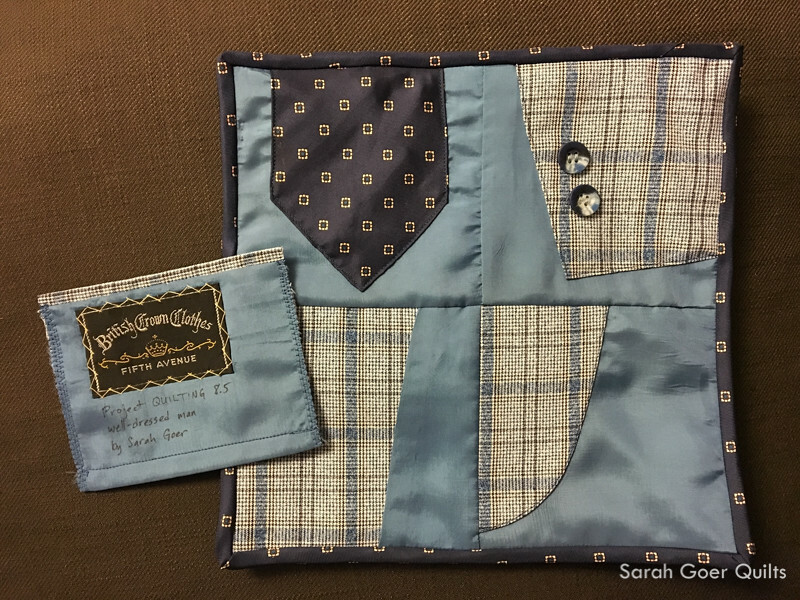 My blocks feature the tie, the cuff of one sleeve with buttons, a section of the inside where the lining met the plaid fabric, and the bottom corner edge of the jacket. The section from the interior was just cut out and used as is, and I machine appliqued the other three blocks. Here's the back with the pocket. I loved this section of the inner lining. 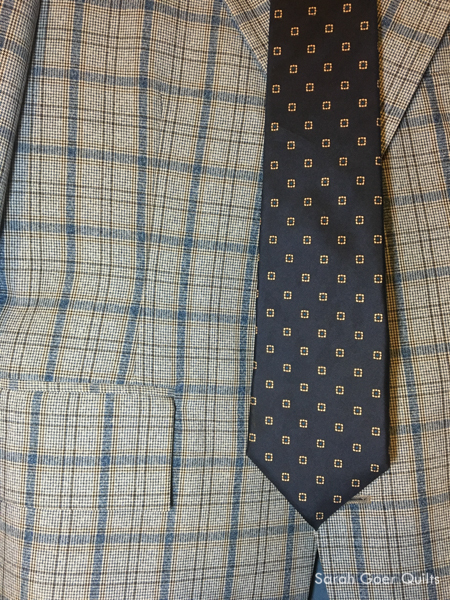 The plaid edge you see was the detail on the interior breast pocket. Early on I knew I was going to use it. Mel suggested I use it for my label, but I thought I might feature it on the front before I decided to work even smaller than planned. Once I decided on the smaller size, I knew it would make a fun label. I opted to finish it and tuck it into the pocket on the back. 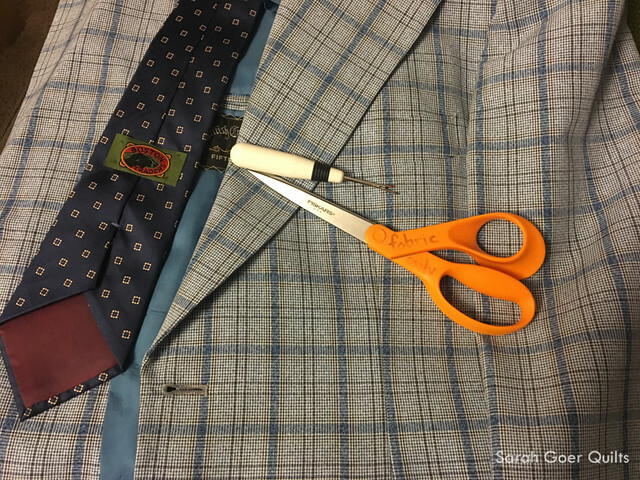 I'm linking up to Persimmon Dreams for the Project QUILTING Well-Dressed Man Challenge. 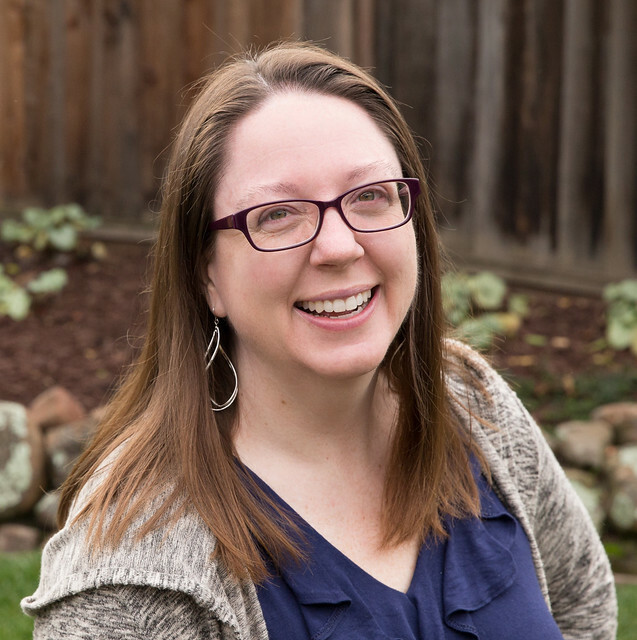 Voting is open over on Persimmon Dreams. You may vote for your EIGHT favorites. You can find me at #51. Posted in Quilting. 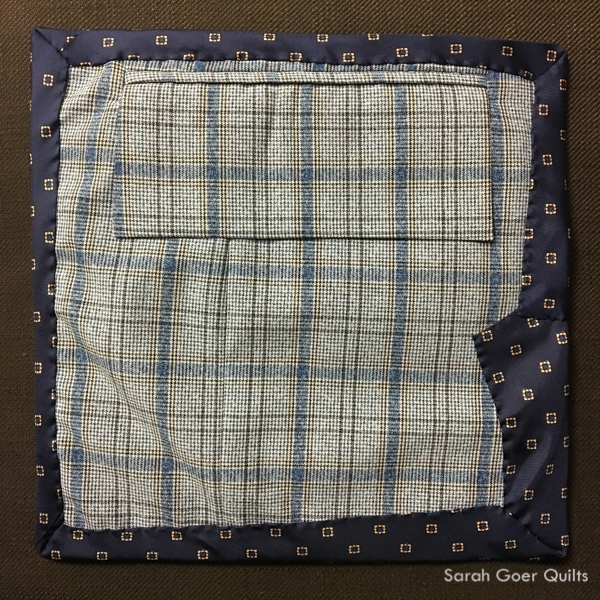 Tags: challenge quilt, finished quilt, make do quilt, mini quilt, Project QUILTING on March 5, 2017 by sarah. This is amazing. Such creativity. I love the back pocket with the label inside. Thank you, Anja. The pocket and label are my favorites! Great project. Wonder what the guy at Goodwill will think of it? I suspect he might think it's a little odd since it's more modern/abstract in design. But I did warn him that since it's a one week challenge it would be a small quilt. :-) Thanks for visiting. 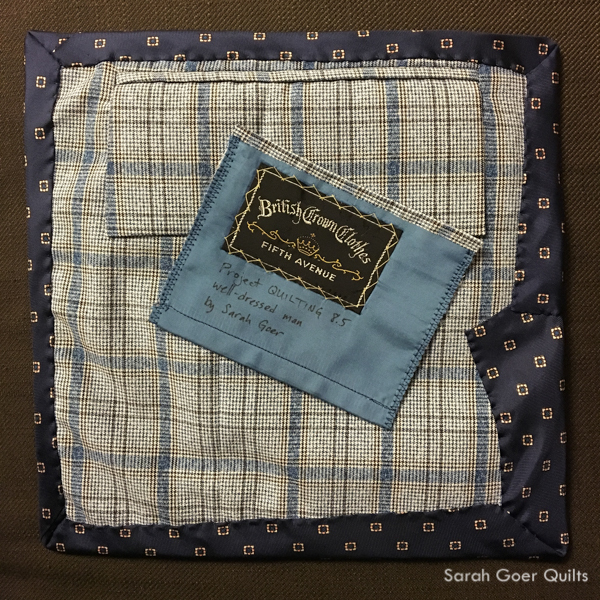 I look forward to hearing what the clerk thinks of the mini quilt if/when you get an opportunity to take it back to show! Putting the label inside the pocket on the back is really clever. 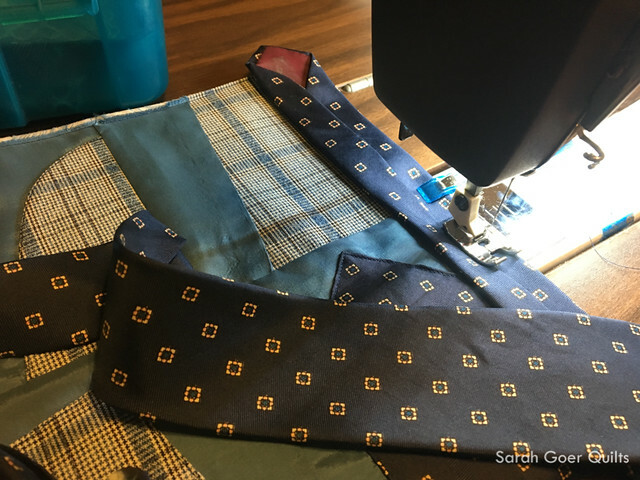 Was working with the tie as binding difficult? Thank you, Yvonne. I'll definitely report back. Actually, the tie was surprisingly easy to work with. I used the existing creases in the tie so perhaps that contributed to its good behavior. ;-) Oh, and I hand stitched it down in the back which probably made it easier. I think the feed dogs would have snagged up the tie fabric. Now this is fun, and very attractive as well. Great challenge. what a great and creative take on the challenge! Bravo!